June 14, 2009 – Bob Bogle (The Ventures) was born on Jan 16, 1934 near Wagoner, Oklahoma. After leaving school at 15 he worked as a bricklayer in California. In 1958, while working on different construction sites he met up with fellow mason worker Don Wilson in Seattle, the two formed a band called The Versatones. The duo played small clubs, beer bars, and private parties throughout the Pacific Northwest. They recruited bassist Nokie Edwards, Skip Moore on drums and changed their name to the Ventures. Bob was a self-taught guitar player, whose use of the tremolo arm was particularly notable and his playing in their 1960 cover of “Walk, Don’t Run” influenced a generation of guitarists including John Fogerty, Steve Miller, Joe Walsh and Stevie Ray Vaughan. The band enjoyed their greatest popularity and success in the US and Japan in the 1960s, but they have continued to perform and record up to 2009 recording in all 38 albums. With over 110 million albums sold worldwide, the group remains the best selling instrumental rock group of all time. During their chart career they are reputed to have outsold The Beatles in Japan, where they enjoyed a loyal following. The Ventures’ 1960s chart success made its way to the UK, scoring top 10 hits with Walk, Don’t Run and Perfidia. 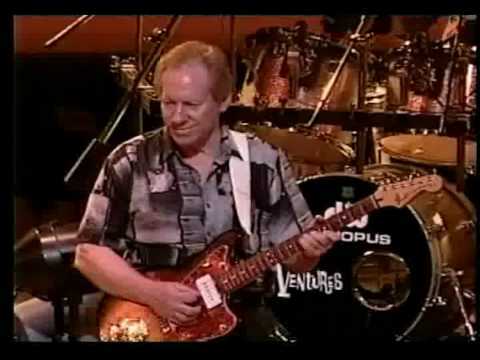 Bob along with The Ventures was inducted into the Rock and Roll Hall of Fame on March 10th 2008 . He had been suffering from non-Hodgkin lymphoma and was unable to attend the Hall of Fame ceremony. Bob Bogle died at the age of 75 on June 14, 2009.